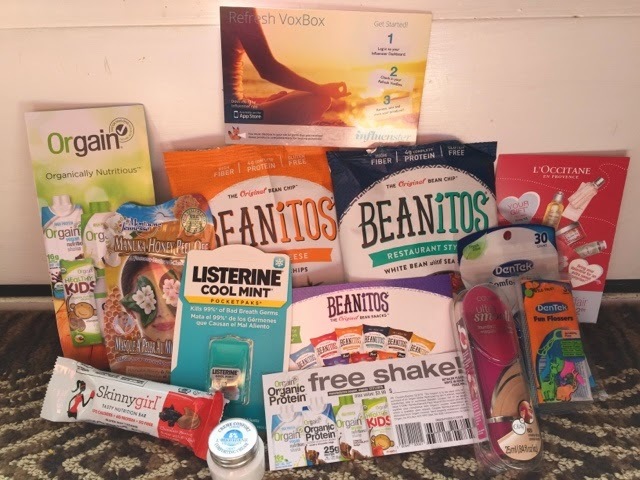 I was chosen to participate in the Refresh VoxBox by Influenster for testing purposes. In this box I received ten items. I received two bags of Beanitos Chips (Restaurant Style and Nacho Cheese), Ultra Smooth Foundation from Covergirl, L'Occitan Shea Butter Light Comforting Cream, Orgain Certified Organic Nutritional Shakes, Montagne Jeunesse Face Masques, Skinny Girl Tasty Nutritional Bar, Listerine PocketPaks, Dentek Fun Flossers and Dentek Comfort Clean Flossers. My favorite item was the Skinny Girl Nutritional Bar which was Chocolate Peanut Butter with Sea Salt. My least favorite item was the Listerine Pocket Packs. I did receive one of my favorite products which was DenTek Fun Flossers and Comfort Clean Floss Picks. What I love about receiving a Vox Box is trying items that you have never tried before. I enjoyed the Beanitos chips so much that I went to the store and bought more with the coupon that was inside the VoxBox. I enjoyed trying out the Montagne Jeunesse Face Masques and the L'Occitan She Butter Light Comforting Cream, both items made my face feel so soft. My children enjoyed the Orgain Certified Organic Strawberry Nutritional Shake, I think I will buy them for my little ones to drink more often. I wear liquid foundation already so it was fun getting to try out the Covergirl Ultra Smooth Foundation. Thank you Influenster for letting me test these really good products. Would you like to receive a Vox Box? Let me know in comments and I will send you an invite.